We wish everybody a Merry Christmas and a Happy New Year. The human ear is mainly adapted to the frequency range where speech is transmitted. Frequencies below this frequency range are less noted although the same physical level is present. In practice, this effect requires higher bass power e. g. by more powerful subwoofers, more subs or a mixture of both. 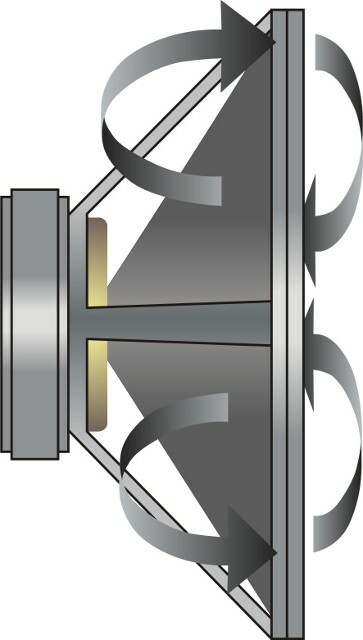 As speakers generally have a low efficiency comparable to a halogen lamp, manufacturers try to achieve the highest efficiency by optimized housing shapes. But not every housing shape is suitable for every event location and audience. The following article should help to find the suitable subwoofer type. The loudspeaker celebrates its 150th anniversary based on the invention of the telephone by Philipp Reis in the year 1861. Already in the year 1878, the electro-dynamic loudspeaker was patented. This kind of loudspeaker is still built into most speaker-systems today. Within the past five to ten years, LEDs became very popular in the lighting industry. With all the hype about even brighter LEDs one might forget that there are still conventional lightbulbs. Sometimes one feels reminded of the “wars” between analog and digital signal processing in audio technology when incandescent lamps are called “warm” and LEDs are called “cold”. On the other hand, the lightbulb’s light efficiency of 5 to 30 lumens per watts or an efficiency of less than 10 % is considered to be very low and not environmentally friendly. This is why the lightbulb is partly forbidden in Australia and in the EU – a development which did not help the LED but the energy-saving lamp which is also not environmentally friendly. For the entertainment industry, the wide selection of different lamps is very positive. Technicians can choose from a large variety of tools to be used for solving a lighting installation. When classical incandescent lamps should be used, one must make a decision between with halogen additive or not. Halogen lamps have a longer live and are a little brighter at the same wattage. Are there any other differences? Which are the main steps in the development of incandescent lamps? The lightbulb’s history dates back more than 200 years. In 1802, the Englishman Sir Humphry Davy experimented with the just invented battery and platinum filaments, but nowadays he is more known for developing the carbon-filament bulb. For the early 19th century, there is also controversial evidence for a lightbulb designed by De la Rue or De la Rive. Up to now, neither the designer, nor the origin or an exact year could be given. The sources speak of an invention around 1820 or even earlier, however, there is no evidence from this period of time. In 1835, the Scottish James Bowman Lindsay publicly presented a lightbulb with platinum filament and vacuum flask, but he didn’t continue to pursue the idea. Further patents of other scientists followed in the 1840s and the 1850s. A mass production never started because platinum has a melting point of approx. 1770° C and the light efficiency was rather low. High material costs also contributed to the failure. 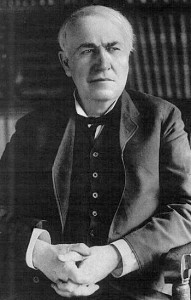 Today, Thomas Alva Edison is regarded as the real inventor of the incandescent lamp as he succeeded around 1880 with carbonized bamboo filaments. With the coal he could work with the double temperature compared with platinum. Edison already had some experience with the coal filament from earlier inventions. The legend that the German Heinrich Göbel already invented a working coal filament bulb in 1854 cannot be maintained when regarding the sources and was maybe only announced due to patent litigations with Edison. The coal filament was quickly replaced by materials like osmium and tantalum which were first available at the turn of the century. The material tungsten with a melting point of 3400° C, which is still being used today, was only available a little later due to the contributions of Carl Auer von Welsbach, the founder of OSRAM, and other scientists. 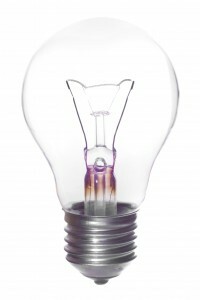 But again, it was Edisons company General Electric (GE) which launched the lightbulb as known today from 1911. 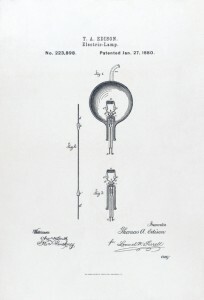 GE’s success remains until today because most household lamps still use the base with Edison thread (E14, E27, E40). Further improvements were reached by adding noble gas and spiral heating coils. The lightbulb’s life is limited because atoms leave the heating coil at especially hot places. These atoms gather at the cooler flask. When a larger flask is used, the gathering can be spread on a larger space and the shadowing of the glass can be reduced a little bit. The number of atoms leaving from the heating coil depends very much from the voltage being used and thus the temperature being reached. Increasing the voltage by 20 % doubles the brightness, but also reduces the life by 95 %. Increasing the voltage by only 5 % still reduces the life by 50 %. In the first half of the 20th century, finding the compromise between brightness or light efficiency and the lamp life lead to an illegal cartel with all big manufacturers like General Electric, Osram and Philips. Still today, there are rumors that manufacturers artificially reduce the lamp life. By adding noble gas like xenon, argon or krypton, the evaporation of heating coil tungsten atoms can be reduced. Furthermore, the noble gas allows a higher heating coil temperature and thus a higher light efficiency. This can be optimized by increasing the interior pressure of the flask, but the maximum interior pressure depends on the ruggedness of the flask. 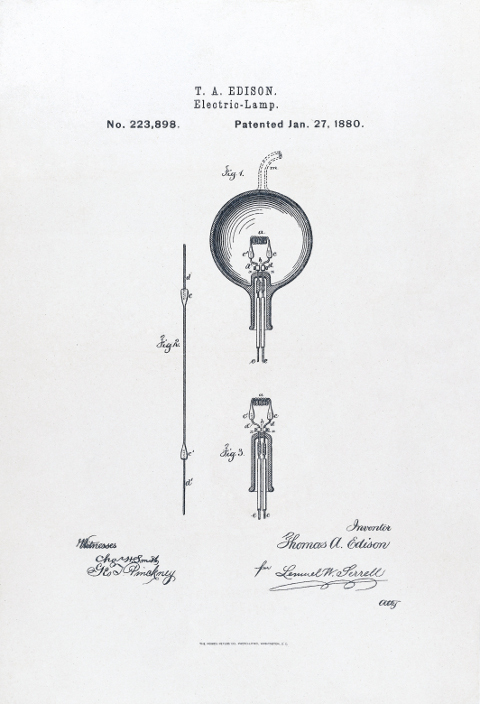 In the middle of the 20th century, the development of halogen lamps brought several essential improvements. Additional halogen like iodine reacts with the vaporizing tungsten and stabilizes a tungsten containing atmosphere in the flask. The tungsten condensate does not gather on the glass but again on the heating coil. As the tungsten moves rather to the thicker parts of the heating coil, the lamp life is not significantly increased. Instead, the halogen enables much more compact flasks so that even higher interior pressure can be realized. Furthermore, a smaller flask reduces the costs for filling it with expensive noble gas. The decisive point for a longer lamp life of halogen lamps is not the tungsten-halogen-circle, but the especially high interior pressure of the gas. A further contribution was the invention of especially rugged and heat-resistant silica glass. Some day, the heating coil of a halogen lamp does also burn through because noble gas and halogen cannot avoid that the heating coil becomes thinner at some places and finally burns through. Mostly, this happens in a critical situation when switching on and when a very high currents runs through the lamp. We refer to the pre-heat-function of many dimmers and lighting controllers which provide voltage to the lamp shortly below lighting up and thus reducing the starting currents. Another advantage of halogen lamps is the much higher light efficiency especially in the low voltage sector. Halogen lamps can be operated at low voltage in households. Why should any technician choose lightbulbs without halogen mixing, when there are so many advantages? Next to the price difference between the two versions, the light temperature and its spectrum is also very important. Even carbon-filament bulbs are still popular as they have their own specifications regarding color temperature and starting behavior. Halogen lamps have a color temperature of 3000 and 3400 Kelvin, “normal” bulbs have 2200 to 2800 Kelvin depending on the wattage and the filling. In artistically demanding surroundings, it may be useful to have bulbs without halogen mixture. Halogen lamps also have the disadvantage that they emit a low portion of ultraviolet light so that skin burns may be caused or color surfaces may be bleached.